The whole world is taking a keen interest in the filming of the new Bond movie SPECTRE, which premieres this autumn. In cooperation with the Swiss James Bond Club, Schilthorn Cableway will be accompanying the Zurich premiere with special activities. But fans needn’t wait until then to see the spotlight on James Bond – on Swiss National Day, 1 August 2015, the world’s first 007 WALK OF FAME opens on the Schilthorn, paying homage to the cast and crew members involved in the making of On Her Majesty’s Secret Service. This is where personalities from the world of the Bond movies will be immortalized at the Schilthorn summit. Each protagonist will feature on an individual information plaque, displaying their photograph, signature and hand imprint in weathering steel, a personal message about the film’s impact on their careers, and anecdotes and impressions of their time in Mürren and on the Schilthorn. These plaques will form a short circular trail that runs from the summit building to the PIZ GLORIA VIEW vantage point and back. 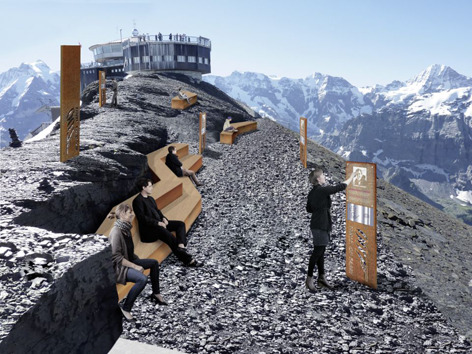 The Public Opening of the 007 WALK OF FAME takes place on Saturday 1 August 2015 on the Schilthorn summit. Many stars from On Her Majesty’s Secret Service will be there and available throughout the day to sign autographs and pose for visitor snaps. Meet George Lazenby, James Bond 007; Terence Mountain, Raphael; Sylvana Henriques, The Jamaican Girl; John Glen, director; Catherina von Schell, Nancy and Jenny Hanley, The Irish Girl. Stunt double Vic Armstrong – who has doubled for all Bond actors with the exception of Daniel Craig – and female stunt double Wendy Leech will also be there. The first opening event will take place on the eve of the public inauguration in the presence of VIPs, special guests and members of the media. “James Bond 007 fascinates and inspires people worldwide,” says Schilthorn Cableway chief executive Christoph Egger. BOND WORLD 007, the virtual exhibition dedicated to the movie On Her Majesty’s Secret Service filmed on the Schilthorn in 1968, has become a huge favourite with the public and attracts scores of Bond aficionados to the Piz Gloria every year. “On the one hand, people are fascinated by the Bond actors and the classic characters such as the Bond Girls and Miss Moneypenny,” says Egger. “On the other hand, we shouldn’t forget the many other contributors to the movie, who often have exciting background stories to tell.” The 007 WALK OF FAME project was designed to capture these impressions in an enduring and visible manner. The 007 WALK OF FAME is based primarily on the location’s own movie, featuring the actors, directors and other protagonists from home and abroad. “First and foremost, the 007 WALK OF FAME is dedicated to our guests, all Bond fans and the personalities involved in On Her Majesty’s Secret Service who supported us when we opened BOND WORLD 007,” says Christoph Egger. The future gradual addition of plaques commemorating further actors and notables from the world of James Bond is planned.